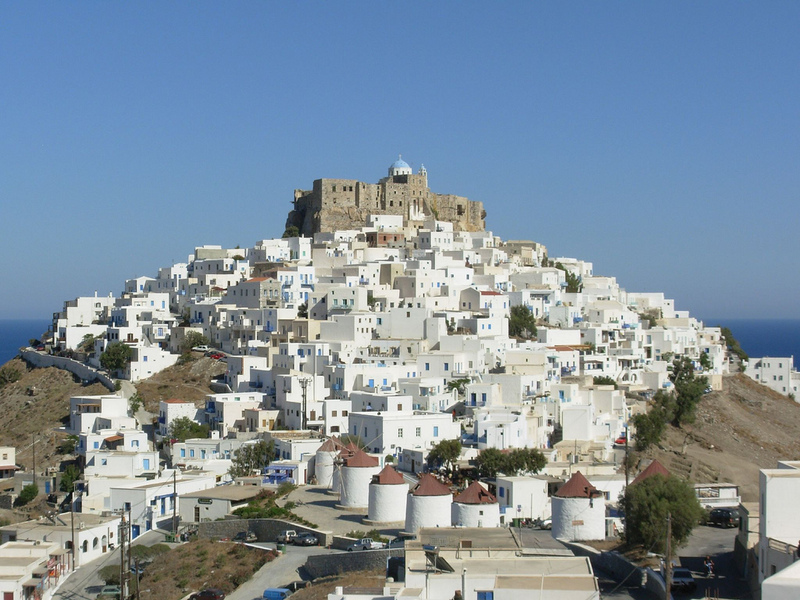 Astypalea is a Greek island with 1,238 residents (2001 census). 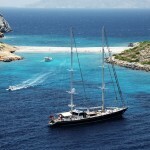 It belongs to the Dodecanese in the southeastern Aegean Sea. 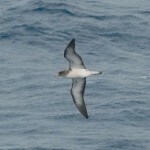 The island is 18 km long, 13 km wide at the most. 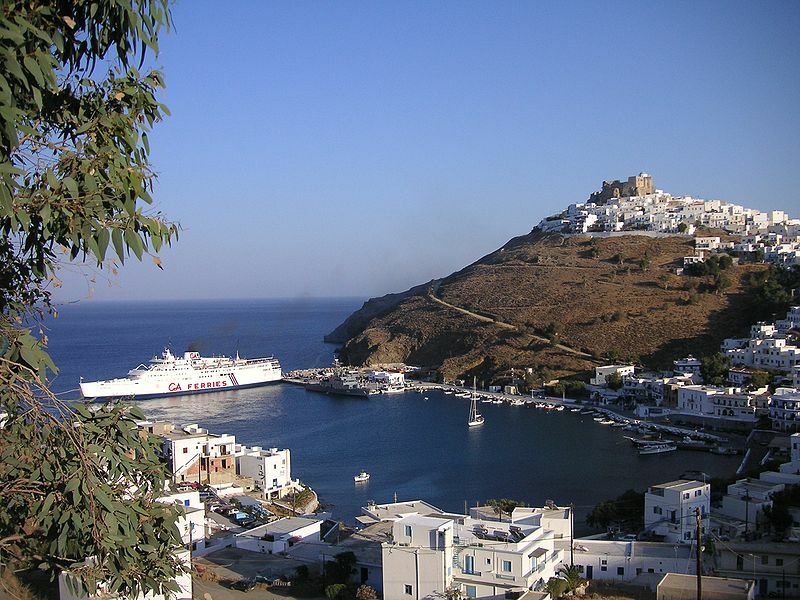 Along with numerous smaller uninhabited offshore islets (the largest of which are Sýrna and Ofidoussa), it forms the Municipality of Astypalea. 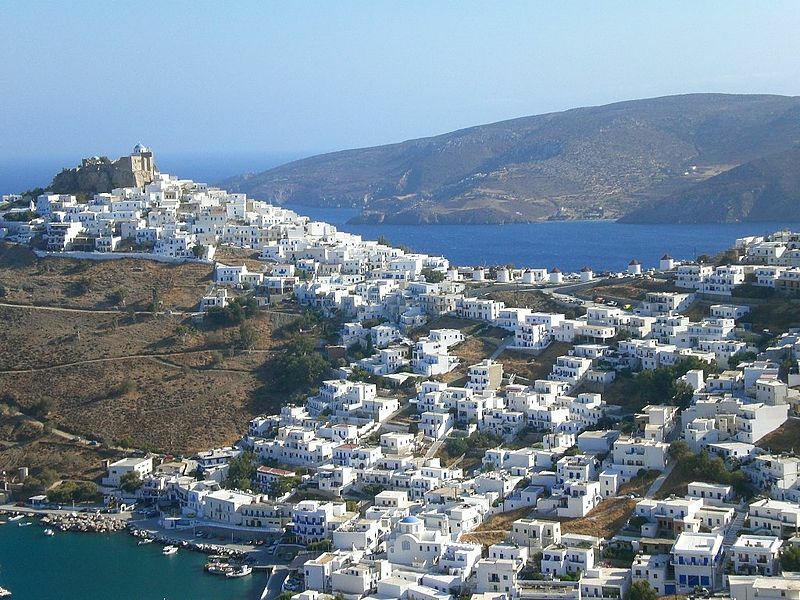 Astypalea is part of the Kalymnos region. 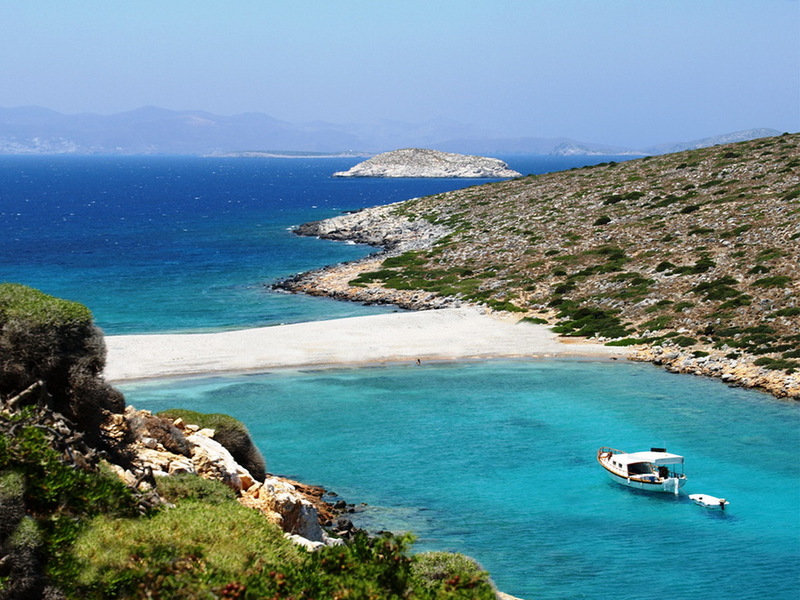 The coast of Astypalea is rocky with many small pebbled beaches. A small stribe of land of around 10 km, almost separates the island in two parts. This shape of the island has a strong resemblance to a butterfly if seen from above. 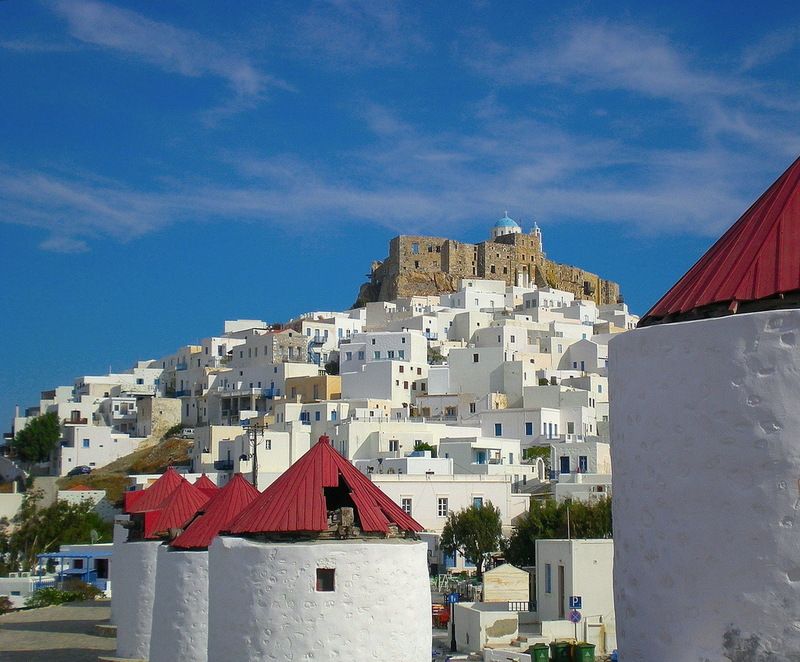 The capital and the previous main harbour of the island is Astypalea or Chora, as it is called by the locals. A new harbour has been built in Agios Andreas on the mid island from where the connections now are west and east with Piraeus and the other islands of the Dodecanese. Flight connections with Athens go from the airport close to Maltezana. 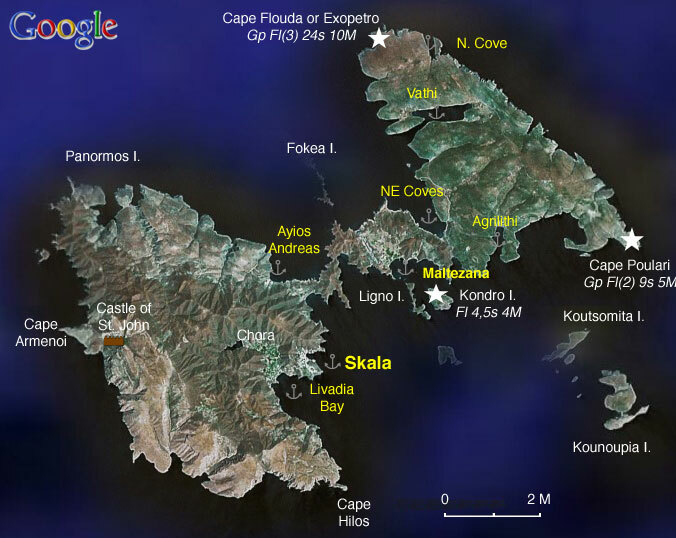 Astypalea, according to Greek mythology, was a woman abducted by Poseidon in the form of a winged fish-tailed leopard. The island was colonized by Megara, and its constitution and buildings are known from numerous inscriptions. The Roman emperors recognized it as a free state. During the Middle Ages it was part of the Byzantine Empire until 1207, when – in the aftermath of the Fourth Crusade – it became a fee of the Querini, a noble Venetian family, until 1522. The Querini built a castle that is still in place and added the name of the island to their family name, that became Querini Stampalia. Astypalea became Turkish in 1522, and the Ottomans kept it until 1912, with only two interruptions: from 1648 until 1668, during the War of Crete, it was occupied by Venice, and from 1821 to 1828 it joined the insurgents during the Greek War of Independence. Occupied again by the Ottomans in 1828, on April 12, 1912, (during the War of Libya) a detachment of the Regia Marina landed on Astypalea, which thus became the first island of the Dodecanese to be occupied by Italy. From there the Italians, on the night between the 3rd and 4 May, landed on Rhodes. The island remained under Italian governance until World War II. 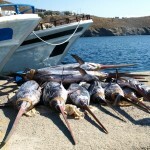 In 1947, together with the rest of the Dodecanese islands, it joined Greece. The text of Astypalea’s treaty with Rome, made in 105 B.C., has survived through a monument found by archaeologists. This treaty has shed some light onto the Roman policies towards the Greeks at the time. 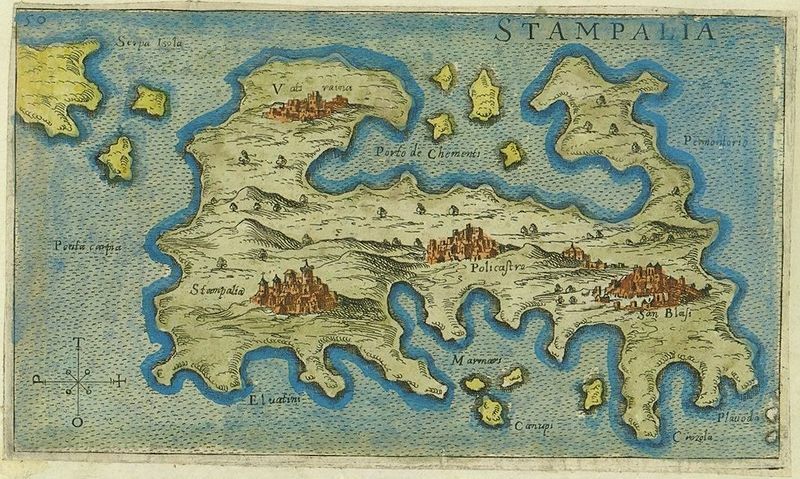 The main feature of this treaty is the formal assumption of complete equality between Rome and Astypalea: The Astypalaians would not aid the enemies of the Romans or allow such enemies passage through their territory or territory under their control, and likewise the Romans would not aid the enemies of the Astypalaians or allow such enemies passage through their territory or territory under their control; in case of an attack on Astypalaia the Romans would come to its aid, in case of an attack on Rome the Astypalaians would come to its aid; etc. Had no other historical evidence survived, finding this text might have led to the conclusion that Rome and Astypalaia were powers of roughly equal size and power. In fact, of course, there is plenty of solid evidence to show that at the time of this treaty Rome was already an imperial city completely dominating the Mediterranean, while Astypalea was a very minor political and military power at this and any other period in its history. 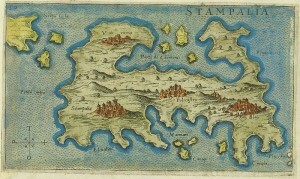 Historians assume that the treaty granted by the Romans to Astypalea was not unique, but a standard form – though the assumed similar treaties signed with other Greek cities have not survived. 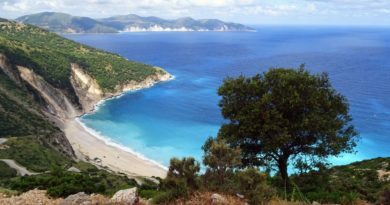 Syrna is a small island about 4 km2 in area to the south-east of Astypalea in the Dodecanese group of Greek islands near the south-west coast of Turkey. It is mostly covered with juniper and garrigue scrub. The few inhabitants raise stock, catch fish and practice arable agriculture. 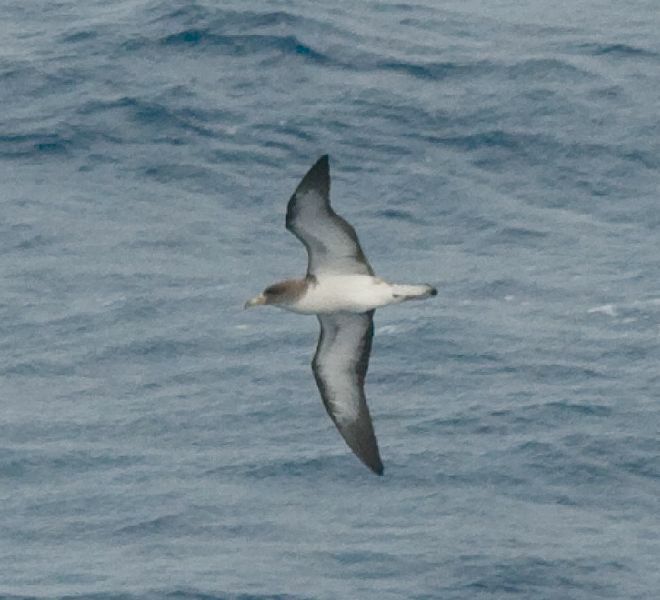 The island is important for migrant and breeding seabirds and raptors, including Cory’s Shearwater, Yelkouan Shearwater and Eleonora’s Falcon. Eleonora’s Falcon (scient. 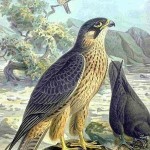 Falco eleonorae) is one of the most important falcons of Greece with a wingspan of 84-103cm and a body length 36-40cm. 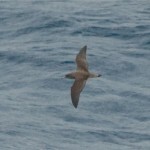 It is a migratory species that nests in the spring in small barren islets, where they reproduce. 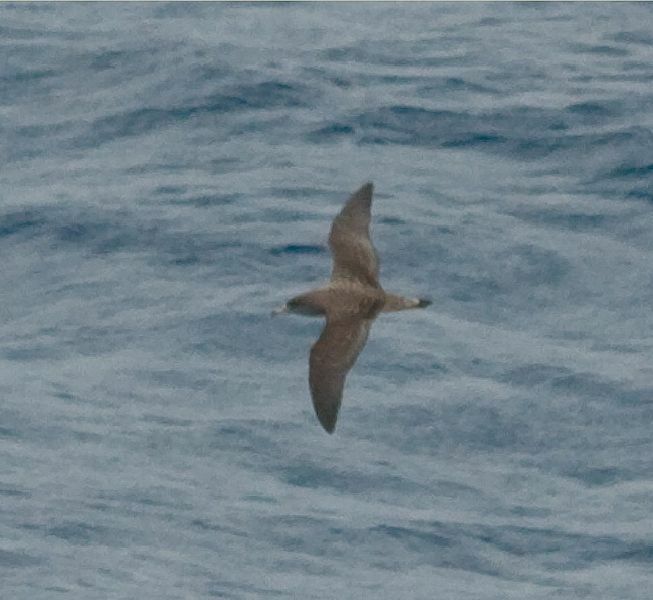 They are also found in Crete, especially in the small islets surrounding Crete, while in winter they return to East Africa and Madagascar. 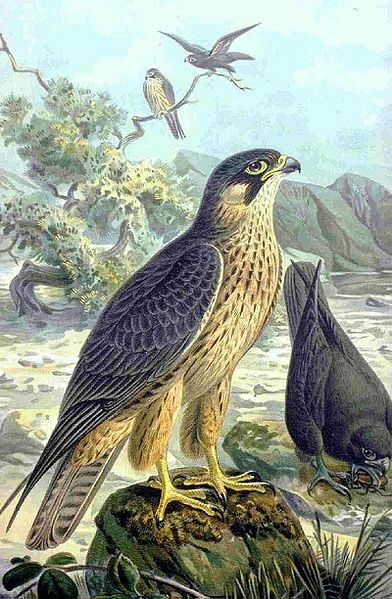 Eleonora’s falcon is very important for Greece because a very large proportion of the world population of it, reaching 80%, nests on rocky islands of this country. A shipwreck of the late Roman period (2nd century CE) was found using sonar technology near the island by the Hellenic Centre of Marine Research in 2000. 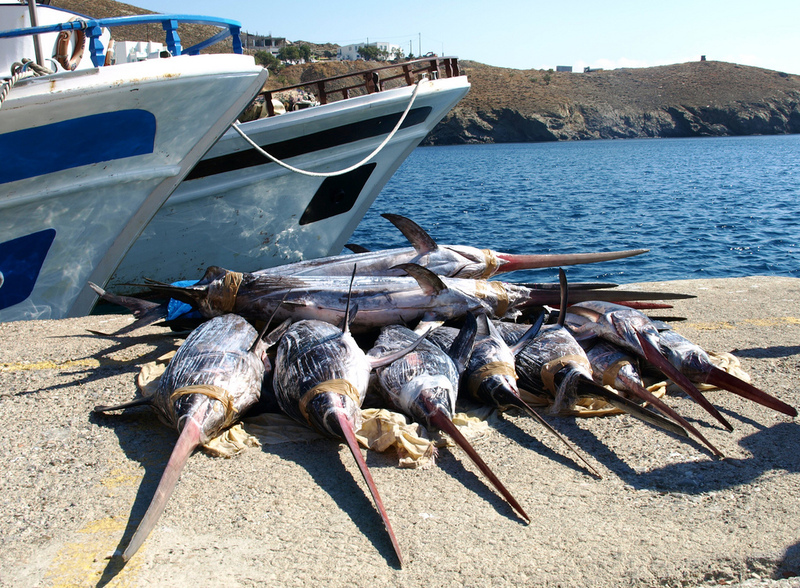 Skala or Perigialos is a safe harbor but subject to violent gusts in a strong meltemi. A new breakwater extension provides secure berthing for around 6-8 yachts med moored to the quay. Water and electricity points are installed but not yet connected (June 2011). Agios Andreas: This is a new artificial harbor on the inner NW side of the island. According to the local fishermen, it provides all weather shelter. 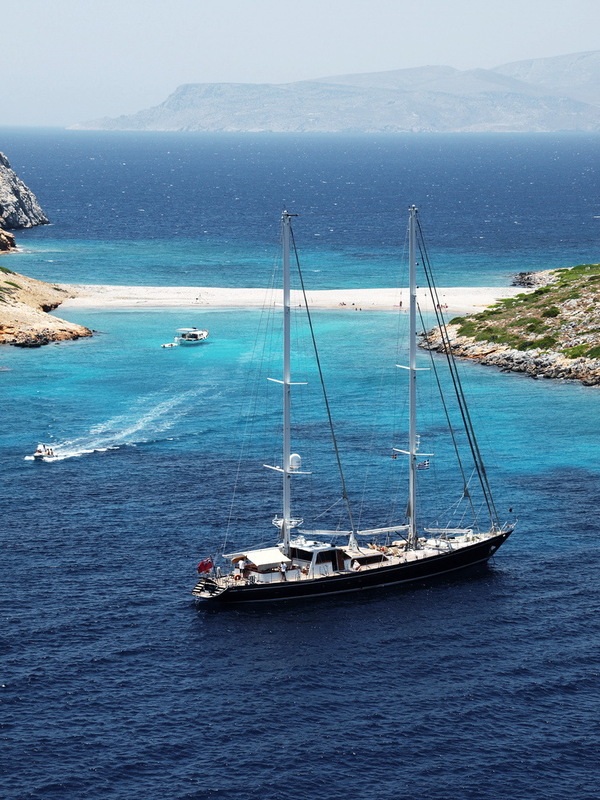 Livadia Bay is a large sandy bay just 1.5 nM around the castle south of Skala. 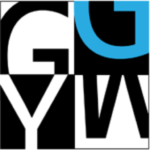 It is much less susceptible to the gusts and very comfortable. Good holding. It is a very attractive sandy beach, low key, with just a couple of restaurants and a few bathers. No provisions. Chora is about a 30 minutes pleasant walk (2.5 km). The bay of Maltezana provides good shelter for N to SW winds but it is somewhat exposed to the SE. Anchor off-shore at 4 m, the bottom is sand and light weed, good holding. Also during the off season there are several moorings that one can use. Ashore there is a very good taverna, Obelix, and a good mini-market. Fuel is available in Skala from a gas station but it does not deliver and it is a good uphill walk. Electricity and water not available.